Please click here for the full report and data tables. [Ottawa – October 10, 2017] There has been a fair bit of debate about whether the core drivers of the new populism are economic or cultural in nature. This latest version of what we used to call materialism or idealism is an important but unsolvable riddle at this point. Did economic stagnation and despair beget rising xenophobia and nativism or were these cultural expressions really the prime mover. Our sense is that both are equally important but the logic favours the economic conditions as at least the trigger of what may be even more challenging cultural forces. First, let’s look at the question of whether racial intolerance is a factor today in Canada. Is it up or down? What is driving it and how is it connected to economic and political forces? Racial intolerance may be an indicator of economic hopelessness and, if you can solve the problem of restoring progress, the additional problem of racism may disappear. The harsh indictment of what Hillary Clinton called the deplorables may miss the legitimacy of the economic concerns and paint this as a problem in identity politics. This may actually add fuel to the problem that is being pilloried by progressives. We have one simple indicator of racial intolerance which is pretty basic but for which we have nearly 25 years of tracking data. We look at the issue of what people think about visible minority immigration. Wariness of immigration was a critical factor in both Brexit and Trump victories and is linked to a more ‘ordered’ and closed view of the ideal society. We are most interested in what people think about the immigration of visible minorities (regardless of the levels of total immigration). Some can say that objections to immigration need not be racial as they can be based on concerns about job competition or demands on public services. 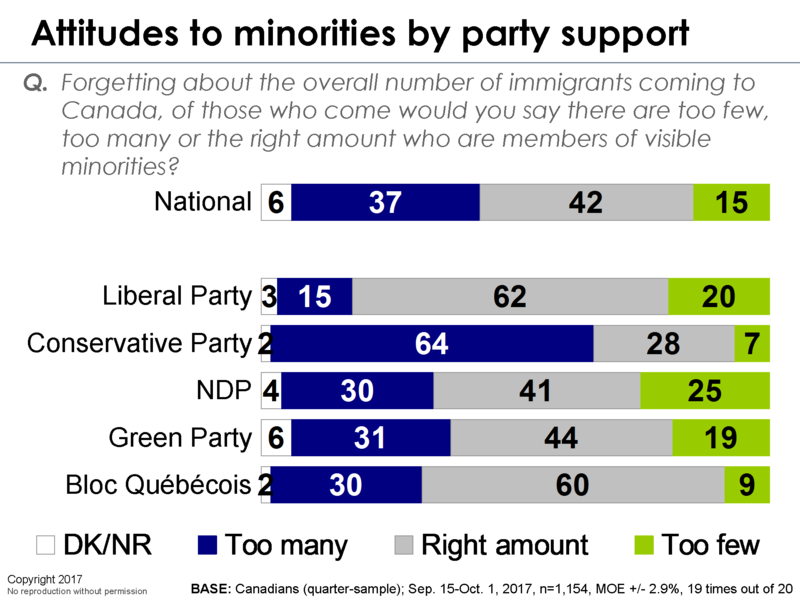 But our tracking question instructs respondents to forget about how many are coming and tell us if too many, the right number, or too few are members of visible minorities (in other words, not white). The time series is revealing. We note that care should be exercised in comparing the live interviewer results (pre-2009) and the more recent IVR results, as the effects of a live interviewer are highly significant and boost the reticence of picking an ‘intolerant’ response by about 10 to 15 points. 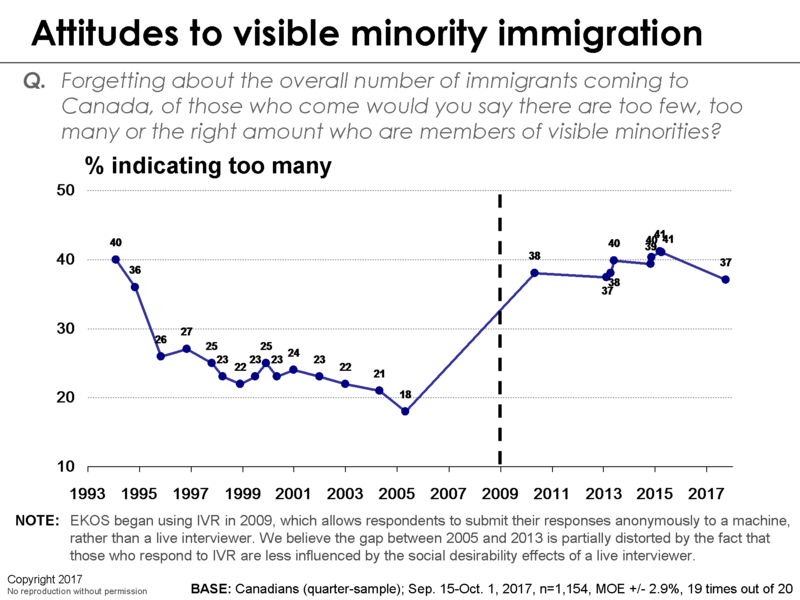 So in comparing the very high numbers in the early nineties to today, we note that opposition to visible minority immigration was much higher in the early nineties and declined progressively. Let’s focus in on recent shift in the visible minority immigration data. About 40 per cent of Canadians reveal racial intolerance on this indicator. It may not be a malignant form of racism, but racism is clearly present and not rare. This form of racial intolerance peaked before the last election and appears to be dropping since; Canada may be pivoting open on this indicator. While higher than in the early part of the century, these numbers are much lower than in the early nineties. This expression of racial intolerance is strongly linked to economic outlook and social class. Working class, poor, and the pessimistic are most opposed. The biggest divide is partisanship with this indicator of racial intolerance being over four times higher among Conservative supporters than Liberals. 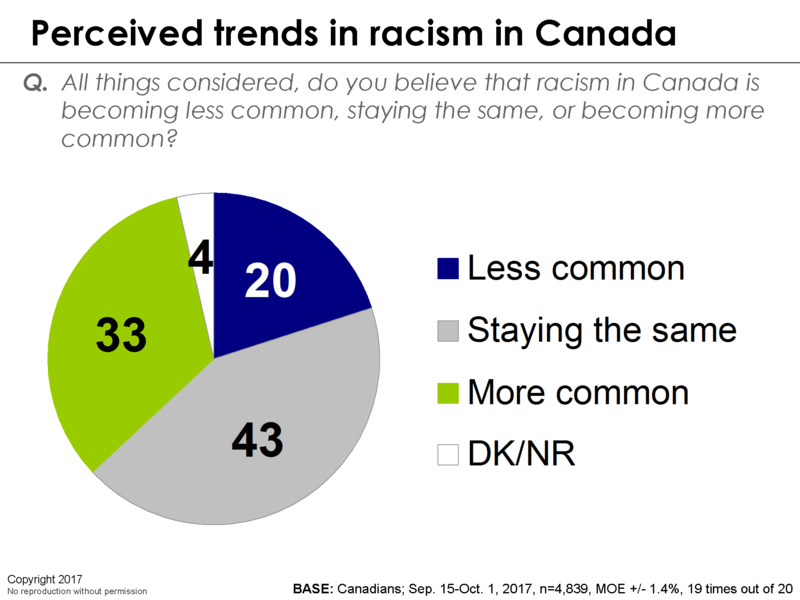 A plurality of Canadians think that racism is remaining stable, but of those who perceive a change, the lean is to the view that racism is increasing. 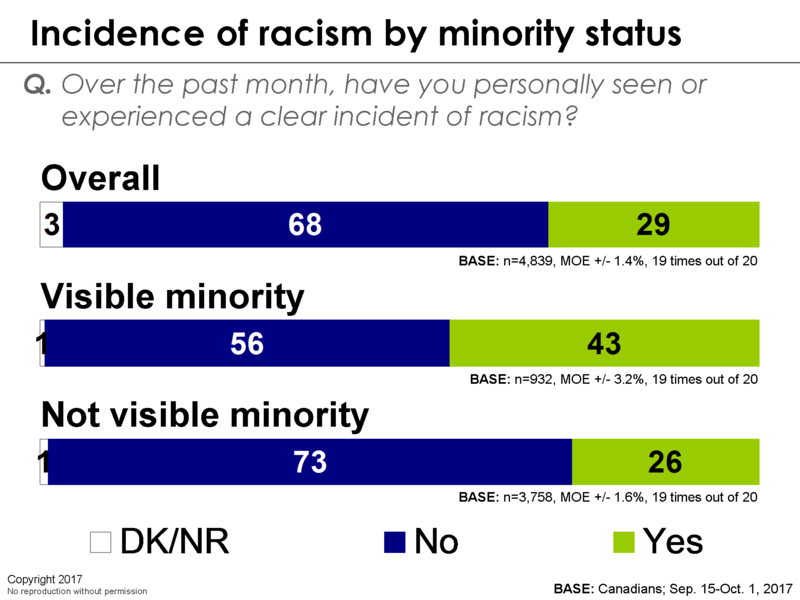 Probing further, 29 per cent of Canadians have personally witnessed or experienced explicit racism in the past month. This is more common with young people and, unsurprisingly, with members of visible minorities. A few years back, we published on the Closing of the Canadian Mind. This article argued that as a response to economic stagnation, support for trade, immigration, and foreign direct investment were all declining. It is therefore highly significant to note that this trend to closing may now be pivoting in the opposite direction. We recently showed support for trade at an all-time high and we just saw that opposition to visible minority immigration is declining. 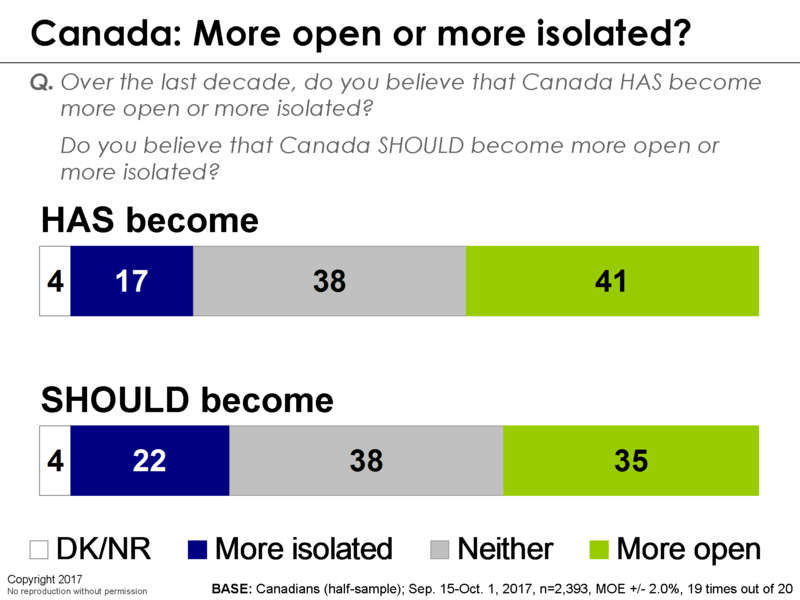 We have been asking Canadians whether they think Canada has become more open or isolated and we have some recent tracking. We lean pretty clearly to thinking we are becoming more open, which corresponds to the trade and immigration trajectories. The margin who think this is a good thing is less decisive which shows that this debate is very much in progress. Notably, the overall direction since 2012 is to a decline in openness. That is important and suggests that populism/nativism may be rising using this tracking. The recent rise in support for greater isolationism is focused in populist segments, working class and poor, Conservative supporters, and the economically vulnerable. How is Canada responding to the new Trump Administration? 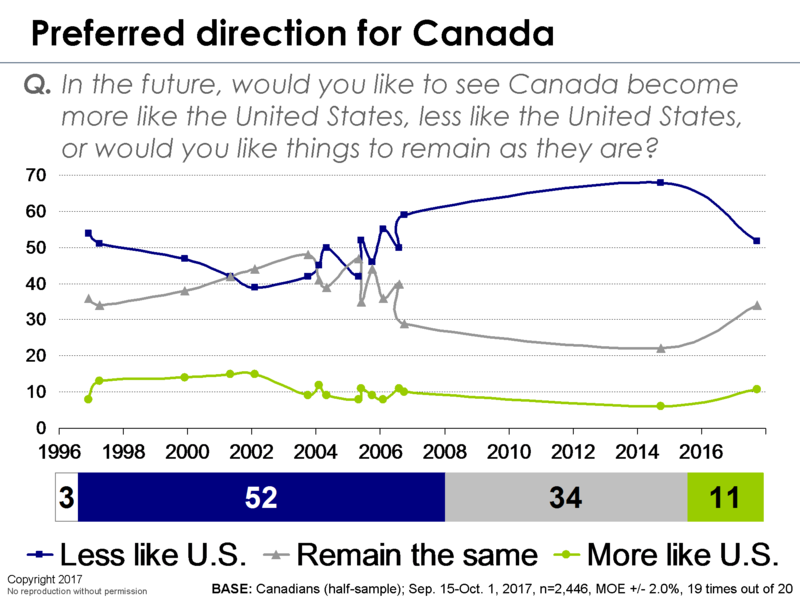 We have updated our tracking on Canadians’ approval of the U.S. President. 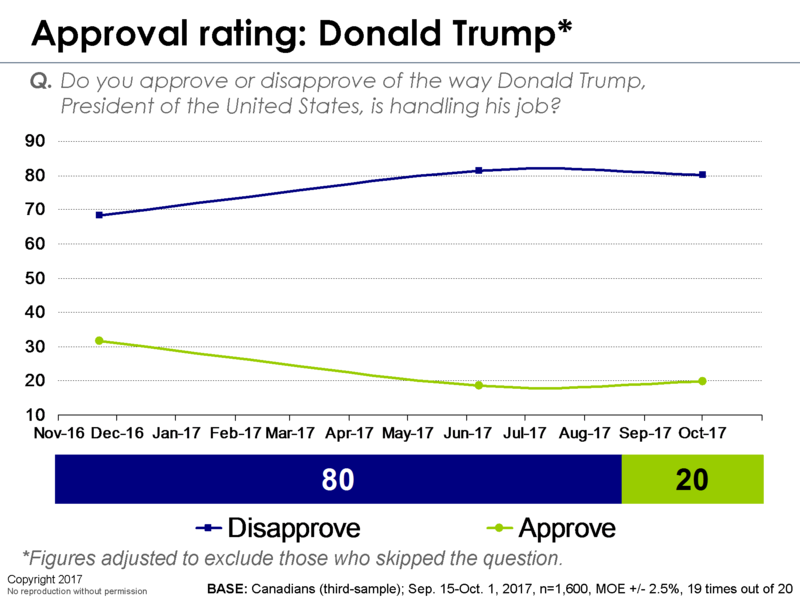 President Trump remains grimly unpopular, with a dismal 20 per cent of Canadians offering a positive appraisal of his performance (unchanged from June). Even his largest support base – Conservative voters – is mostly dismayed with his actions and there is no regional or demographic group anywhere in Canada that gives President Trump a net positive approval rating. 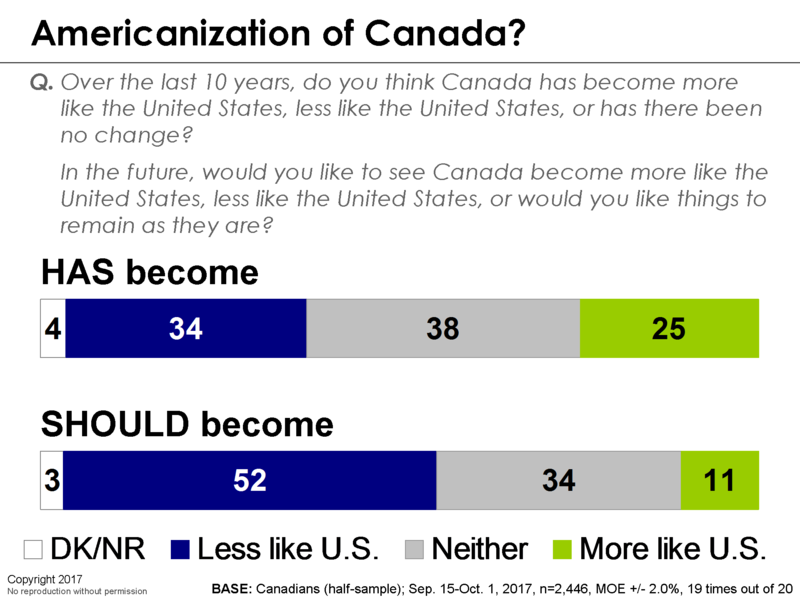 We have seen an unprecedented drop in the percentage of people who think Canada is becoming more like the United States and a drop in the percentage who think Canada should become more like the United States. Clearly, Canada is responding to Donald Trump’s presidency is ways that suggest they want to track differently. One of the key ingredients of Donald Trump populism was an ‘American first’ policy – a foreign policy doctrine that instructs American interests to be placed above all other considerations. We were interested in whether the same populist forces that attracted voters to Donald Trump are at play in Canada. 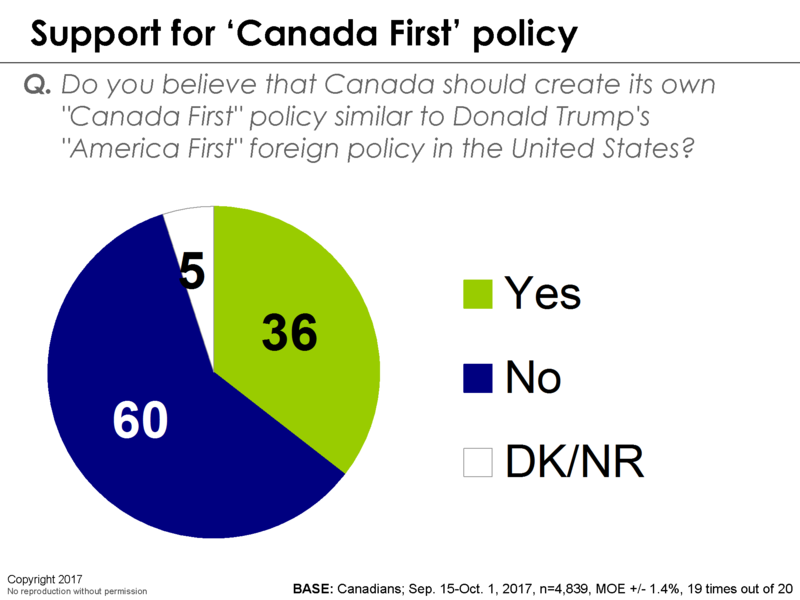 In other words, is there a constituency for a Canada first movement, analogous to President Trump’s ‘America first’ movement? For most Canadians, the answer is decisively no. But there is a sizeable minority that would applaud such a movement. Unsurprisingly, supporters tend to be the same people attracted to other populist appeals, which includes the less educated, the working and poor, Conservatives, and the economically pessimistic. This survey was conducted using High Definition Interactive Voice Response (HD-IVR™) technology, which allows respondents to enter their preferences by punching the keypad on their phone, rather than telling them to an operator. In an effort to reduce the coverage bias of landline only RDD, we created a dual landline/cell phone RDD sampling frame for this research. As a result, we are able to reach those with a landline and cell phone, as well as cell phone only households and landline only households. The field dates for this survey are September 15 – October 1, 2017. In total, a random sample of 4,839 Canadian adults aged 18 and over responded to the survey. The margin of error associated with the total sample is +/- 1.4 percentage points, 19 times out of 20.